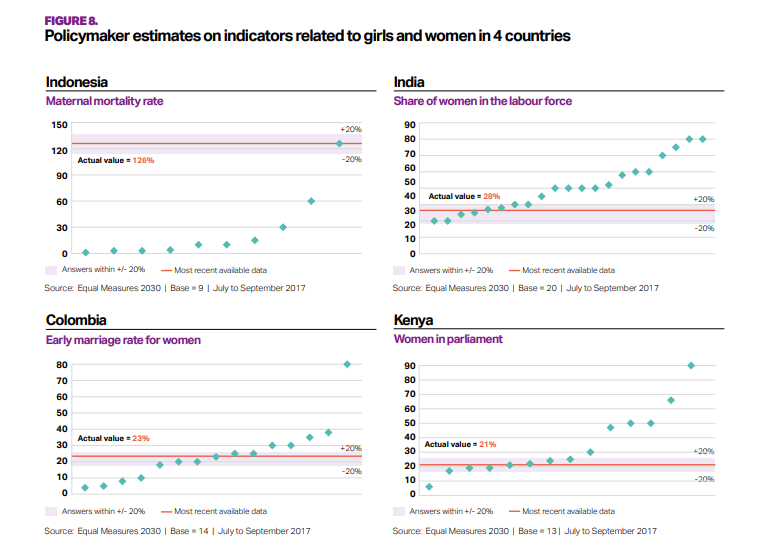 Policymakers in 5 different countries (Colombia, India, Indonesia, Kenya, and Senegal) were asked to give their estimate on indicators related to girls and woman’s issues. Examples are share of female labour force, early marriage rate for women, etc. It is not explained what the diamonds stand for (they stand for one answer of a policymaker). A summary of the answers which shows how far off the different policymakers were for each topic would facilitate the interpretation of each chart. The gridlines are not necessary. They compete with the most recent available data line for attention. I wanted to highlight the topics which the biggest discrepancy between estimate and actual measure. I achieved by calculating the average of all answers of all policymakers and country and comparing this to the correct answer right next to it. I opted for a diverging bar chart. This is normally a good choice when comparing 2 measures over multiple topics. I also added an additional overview box to the dashboard. The arrows show if the policymakers on average have overestimated or underestimated an issue. The colors signal if the average of the policymaker’s answers lies within the 20% range of the correct answer. The arrows are confusing since they display two measures at the same time: Overestimation/Underestimation with the direction of the arrows and within 20%range / not within 20% range with the color palette. This might be confusing because either preattentive attribute (color and shape) could represent either measure. The comparison between the correct answer and estimate could be facilitated by using the correct answer as a target rather than showing it as an individual bar. Now, the correct answers are not separate bar charts, but target lines in the estimates. Also, I got rid of the arrows and replaced them with bar charts which show the difference between guess and estimate. The bar charts are colored depending on if they fall within the 20% range of the correct answer or not. I got rid of some colors as well. The background color now is in a more subtle eggshell tone and the countries, which are used as filters, are colored in dark grey rather than in pink.